“Optoma was a great and open-minded partner for this very specific and technically difficult joint venture project." The fully-featured WU1500 installation projector, built for demanding professional applications was chosen for the outdoor summer festival due to its excellent performance, features and brightness. Motorised lens shift made it easy to position the image exactly where it was needed during the set-up, while a choice of two different colour wheels allowed the right balance of colour and brightness, perfect for the screenings in front of large audiences. 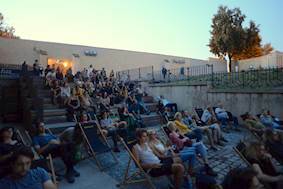 Задача: The summer cinema season in Prague is hugely popular with open-air venues operating all over the Czech capital. The National Film Archive at St Agnes Convent was to take place from the 21st June - 8th September. The biggest challenge was to ensure the projector was easy to install and capable of beaming bright images both day and night for all viewings outdoors. Решение: The Optoma ProScene WU1500 and the BX-CTA21 lens was selected as the best fitting solution for the outdoor summer festival due to its flexibility and capabilities of withstanding demanding professional applications. Image quality, performance and reliability were of paramount importance. 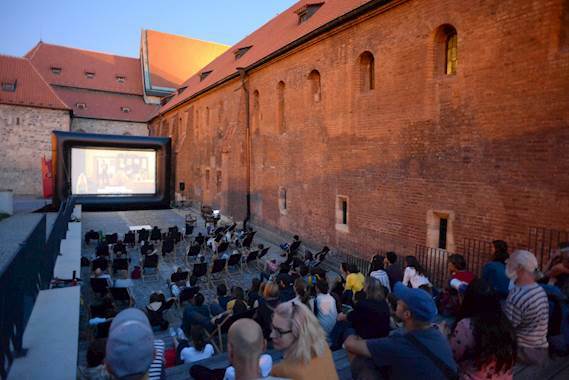 The National Film Archive (NFA) is an outdoor summer cinema event in Prague. It is a joint venture between the National Gallery and National Film Archive which aims to showcase both the classic and brand-new Czech directors. Many of the films are digitally restored versions by NFA. The National Film Archive required a bright and powerful projector that was reliable and capable of continuous operation. The biggest challenge was ensuring the selected projector was flexible so that the installation process was quick and easy. As well as this, it was important that it could display quality screenings of digitally restored and new films in front of big audiences both during the day and at night. 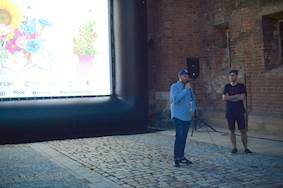 The fully-featured WU1500 installation projector, built for demanding professional applications was chosen for the outdoor summer festival due to its excellent performance, features and brightness. With motorised lens shift, zoom and focus combined with 360° operation and six lens options it provides total flexibility for a simple, trouble-free installation. With native WUXGA resolution, 12,000 lumens brightness and 5000:1 contrast, the WU1500 delivered vivid, crystal-clear images while its dual lamps with lamp relay and 24/7 operation provided ultimate reliability. 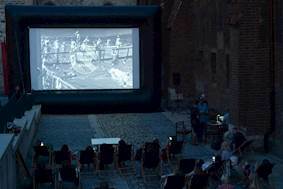 Screenings were seen by 1754 viewers, with average 92 viewers per screening. All screenings took place in a historic area of St. Anežka Monastery, which is also part of the National Gallery. The equipment worked perfectly and the event ran smoothly due to the powerful and flexible Optoma WU1500 projector. David Havas, the NFA Cinema Ponrepo Manager at The National Film Archive commented: “Optoma was a great and open-minded partner for this very specific and technically difficult joint venture project."